"Ice Cap" redirects here. For the Sonic the Hedgehog 3 level, see IceCap Zone. For the Sonic Drift 2 course, see Ice Cap (Sonic Drift 2). 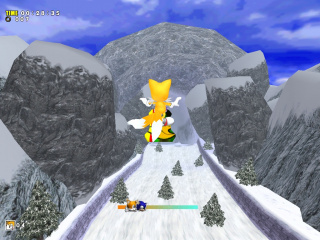 Ice Cap is an action stage in Sonic Adventure, located on Angel Island. This is the standard Sonic ice stage, but with a bit more puzzle solving and more action towards the end. The music is soft and lazy, like a cold winter morning—that is, until the avalanche starts. Ice Cap is broken into three parts. After losing the grey Chaos Emerald to Eggman, Sonic and Tails visit this frosty locale to find the green Emerald, while Big explores the limestone caverns for Froggy. This part is only accessible by Sonic. The goal is to reach the limestone cave at the other side. There is a short cut in the form of some numbered light pads at the bottom of the stage just as you exit the cave you start in. The first pad is a little tricky to stand on, but once you do, you'll zap to the end in no time flat. This section is accessible by Sonic & Big. Sonic's goal is the follow the path around the edge to work his way up to the numbered warp pads. The last pad will knock the giant icicle down from the ceiling giving Sonic a means of escape. For Big, this section offers several pools to ice fish in as well as several underwater areas to explore. Be sure to keep an eye open for the giant dinosaur skeleton. While less like an action stage and more like a minigame (in fact, this segment of the stage can be replayed in the Sub-Game Trial menu), this section is available to both Sonic & Tails. Snowboard down the mountain to outrun the avalanche. 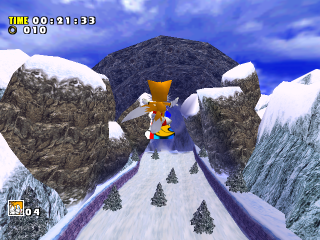 Watch for the yellow ski jumps and be sure to press the jump button to send your character flying farther. Eggman ships will come by and drop bombs, so watch out. In the Dreamcast version of Sonic Adventure, you can change the color of Sonic's board by pressing or . This page was last edited on 9 October 2018, at 14:51.